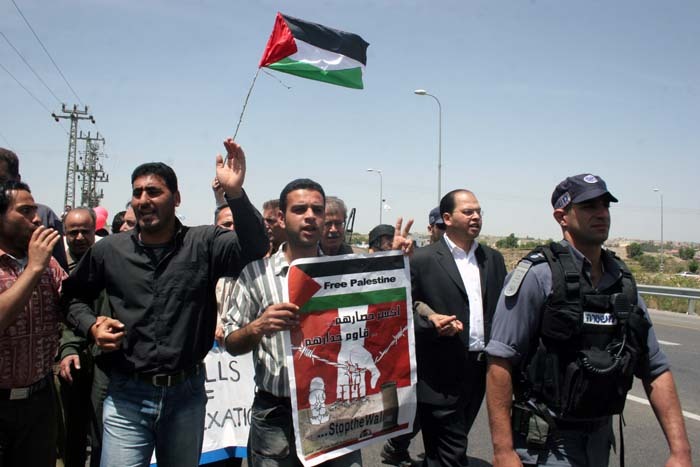 Personal Reflection on Gaza… A letter I Wrote to Friends…. … I acknowledge that I am doing nothing and acknowledge that my presence here is not providing any relief to those in Gaza who are suffering or in the West Bank who are growing in hopelessness. My presence here is mostly important for my internal development and growth and in preparing for the future, a future where real opportunities for peaceful coexistence based on equality are made available to all. Since this war on Gaza began, I have been in a deep process to distinguish my own emotions and reactions and even interpretations and identity from the reality, but more important it has been a process to distinguish the nails in my feet from my responsibilities for the future. I hear and sense the pain and my heart breaks with the cry of every mother or father that lost a child or a child that lost a parent. At one point every time I saw a child from Gaza on television I saw the face of my daughters, Layaar or Larina. I just returned from an incredible experience. From the 25th of September to the 10th of October and for the first time in my life I traveled to Latin America, more specifically to an incredible area in the north of Colombia, where the absolute beauty and tranquility of God’s creation and the majesty of Mother Earth become one. It is also a place where those commitment to be agents of peace clash with those who are addicted to greed, power, control and violence, and who are willing to destroy everything in their path in order to fulfill their craving. From the 24th of September to the 10th of October i will be participating with hundreds of people from across the world in a Grace Pilgrimage for Peace in Colombia. The idea for this pilgrimage grew out of the long standing cooperation between the Peace Research Centre Tamera, Portugal, and the Peace Village San José de Apartadó. Together with the inhabitants of other Colombian Peace Villages, they will show with this peace action their commitment to build up a global peace force which no longer stops at national borders. The pilgrimage will pass through villages and hamlets surrounding San José, where, due to their remoteness, people live near military posts, police headquarters and other significant locations of the rebellion, totally unprotected between the fronts of the civil war. The goal of the pilgrimage is to become familiar with the threat to which Colombian peasants are exposed, to develop peace strategies, and to strengthen the Ring of Power – a confraternity for a future without war! 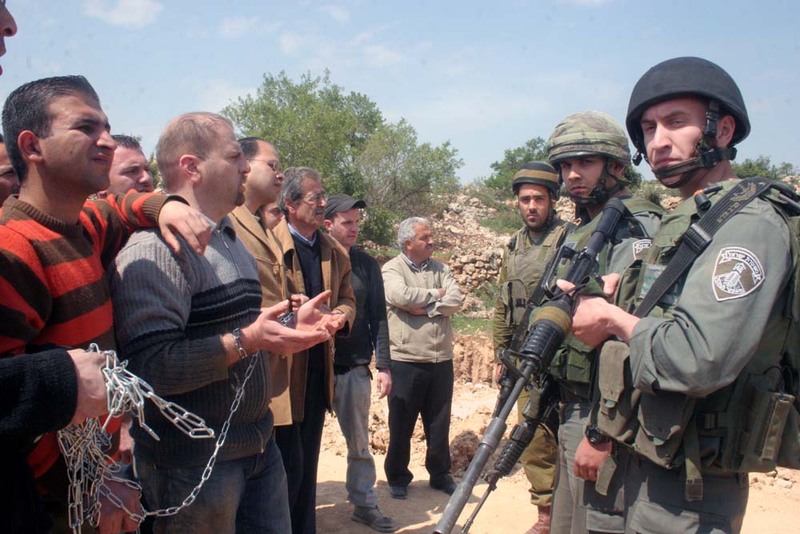 The southern villages of Bethlehem have been organizing weekly nonviolent resistance activities to the building of the Apartheid Wall that will ultimately separate the farmers from 70% of their agricultural land. The activity this week witnessed an evolution of size and strategy. 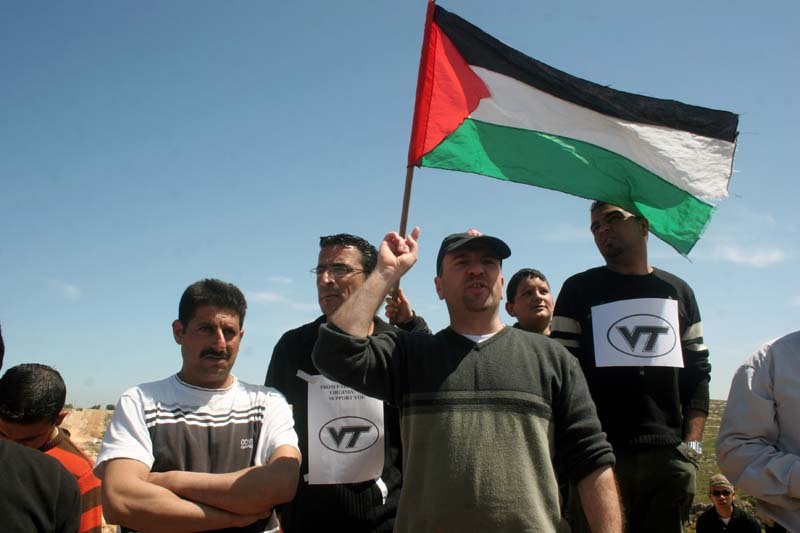 For the first time, over 200 participants (Palestinians, Israelis, and Internationals) joined in the direct action; for the first time, the committee responsible for organizing the action included new members from villages in the South of Bethlehem and activists from the northern villages of Hebron (Beit Umar), and for the first time their was a clear increase in the number of International and Israeli activist. 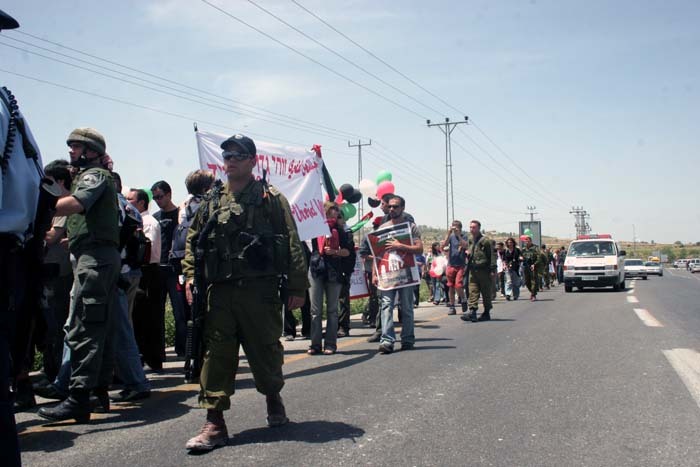 On the strategic level, the success of the previous actions empowered the organizers to target a location that was perceived as impossible to reach, the Bethlehem-Hebron Road (also know as Road 60). Once the wall is completed in this area, Palestinians will not be able to travel on this historic route which will only be used Jewish settlers. Palestinians will only be allowed to use back and side roads increasing the duration of any trip by over 200% at minimum (i.e. to go from Bethlehem to Hebron will take 1 hour instead of the usual 15 minutes). 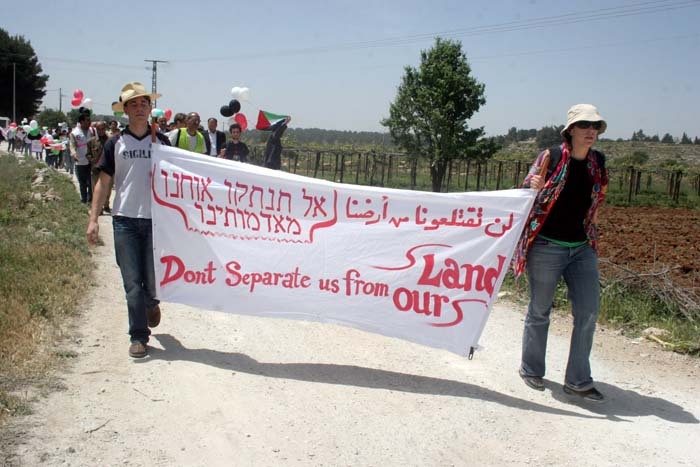 The goal of this nonviolent action was toprotest on this road and to express our opposition not only to the building of the wall but also to the continued existence and expansion of settlements that are the cause for building the wall, (the wall guarantees the land for future settlement building and expansion). As soon as we began the procession, tens of armed Israeli troops came and attempted to stop the protest from moving to the land. The demonstrators broke into the army wall that was created and we continued our procession to the land near the main road where the Israeli soldiers used violence again to try to suppress the action (several were injured including journalists). Several people gave talks denouncing the building of the wall and called for a real and justice peace between Palestinians and Israelis. Friday prayer was then conducted on the land. 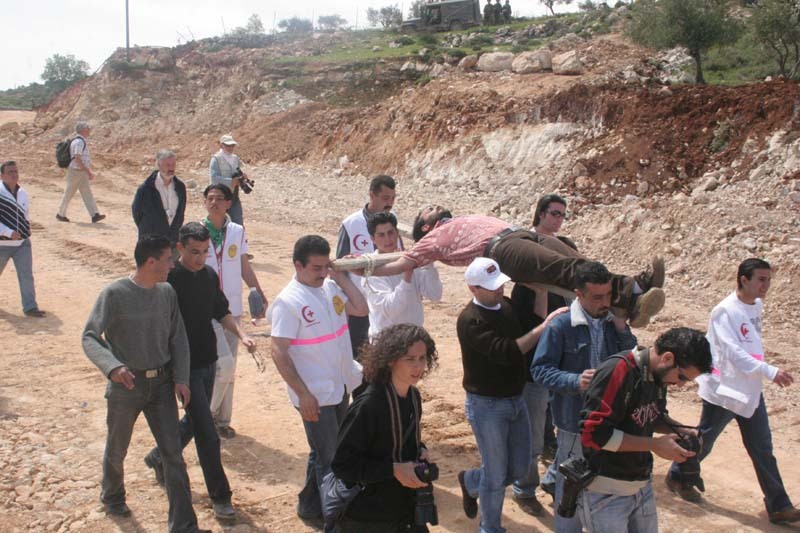 On the return back to the location where we began the action, the Israeli soldiers again pushed and yelled. It was truly wonderful to see the commitment to nonviolence by the more than 200 participants. 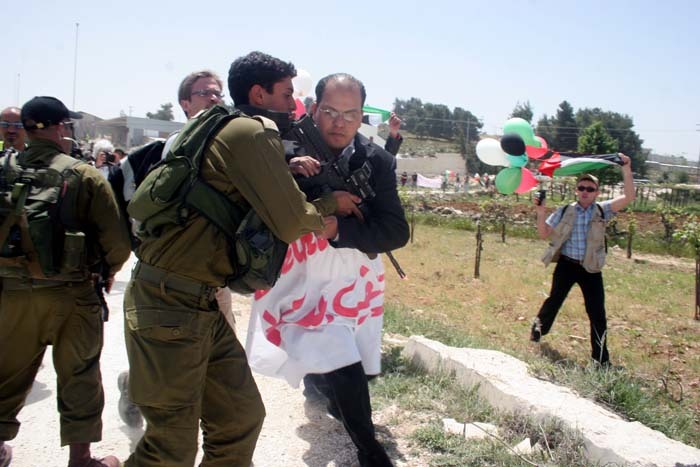 The level of frustration by the Israeli army to the success of the nonviolent activity was not witnessed on the site; the retaliation took place on our way to our homes. 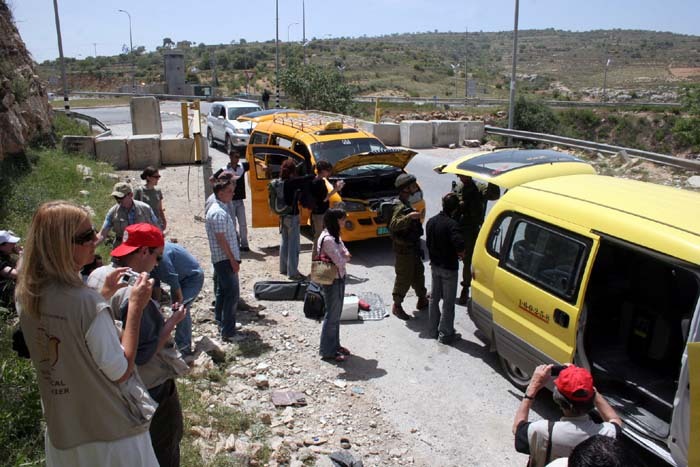 Israeli army check points were erected on the entry ways to all locations where the participants came from and cars that were at the sight of the action were stopped, participants were insulted, some were forcefully removed from the cars and then cars and individuals were searched for almost an hour. 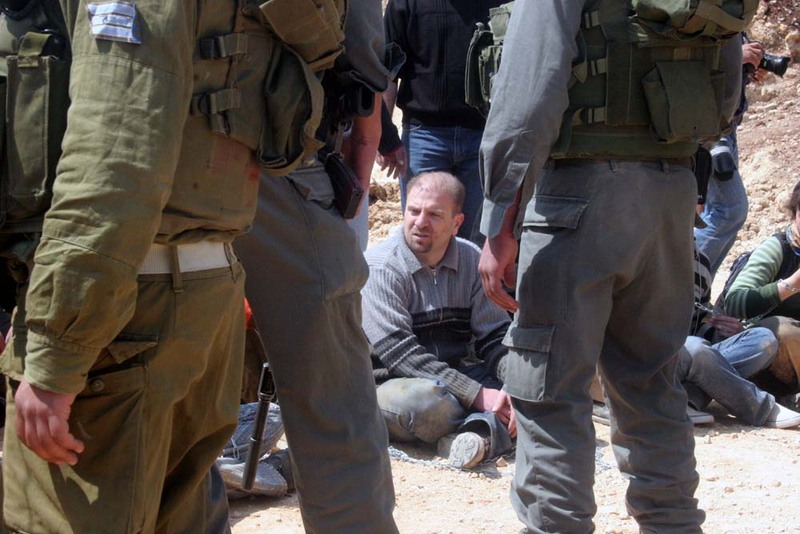 Of course the Israeli army knew there was nothing to search for, but that seemed to be the only response they can think of to “punish” the participants for engaging in this action. My hope is that nonviolent action does not only give us an opportunity to show the world our rejection of injustice, but to also give us an opportunity to open the eyes of those who are doing the injustice to truly think about what they are doing. Yes, at first it may be frustrating to them as we challenge their believe system and ideologies, but then their humanity will overcome their prejudice. 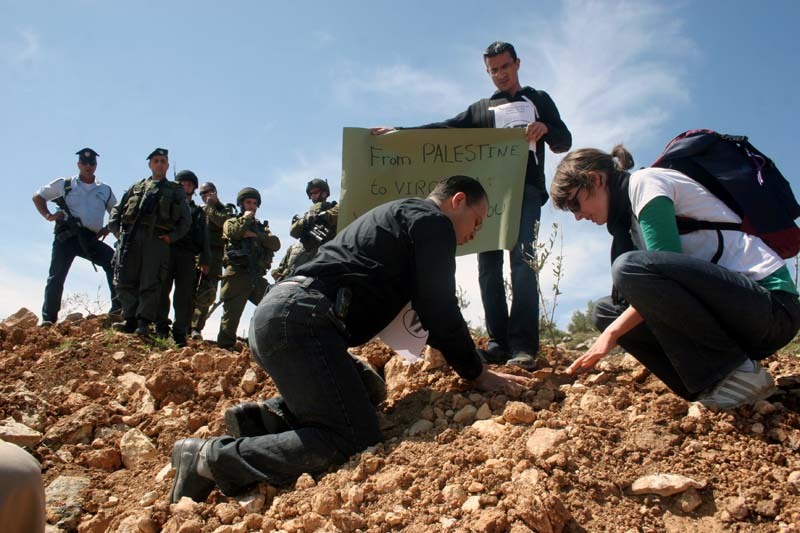 Once we reached the path created by the by the bulldozers for the building of the Apartheid Wall we dug the earth and plated the thirty two olive trees in a row – instead of building an ugly wall that divides people, let us plant trees that bring people together. Several of the participants made statements condemning the violence that we all, as the human family are witnessing and condemning the building of the Apartheid wall and the killing of innocents. Over 150 Israeli soldiers came to dismantle our protest. Our commitment to nonviolence and to achieve our goal completely paralyzed their weapons and their goals and eventually our power made them withdrawal. 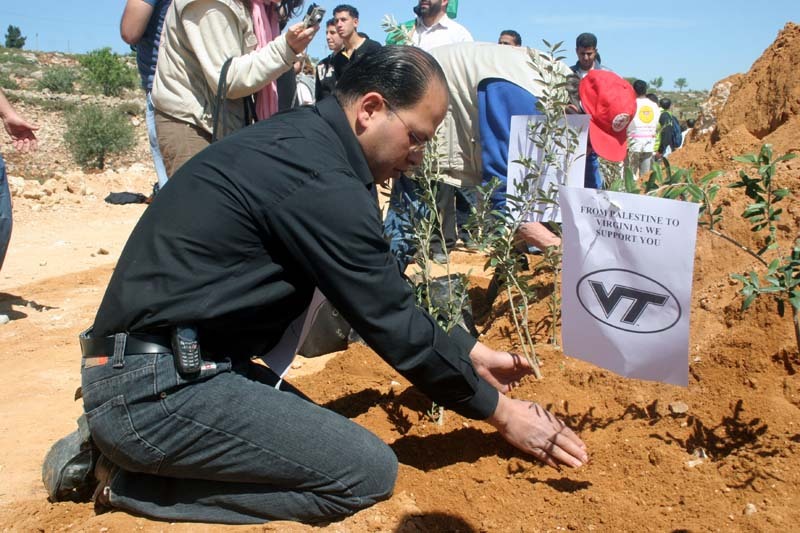 The planting of the trees was followed by reciting the names of all those who were killed in the Virginian massacre followed by a fifteen minute period of silence before the group moved back to the villages. The Rev. Dr. Martin Luther King Jr. said “where there is an injustice somewhere … there is an injustice everywhere.” This also means that where there is violence somewhere there is violence everywhere… We need to work for peace somewhere so that peace can also spread every where. 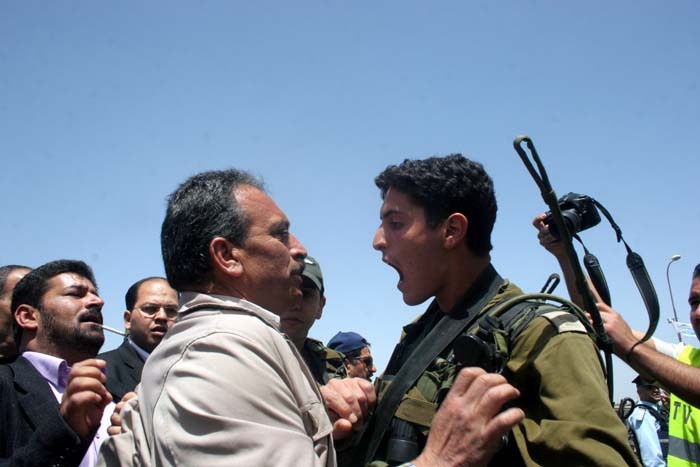 Israel’s Message to the Palestinians: Do not use Nonviolence! 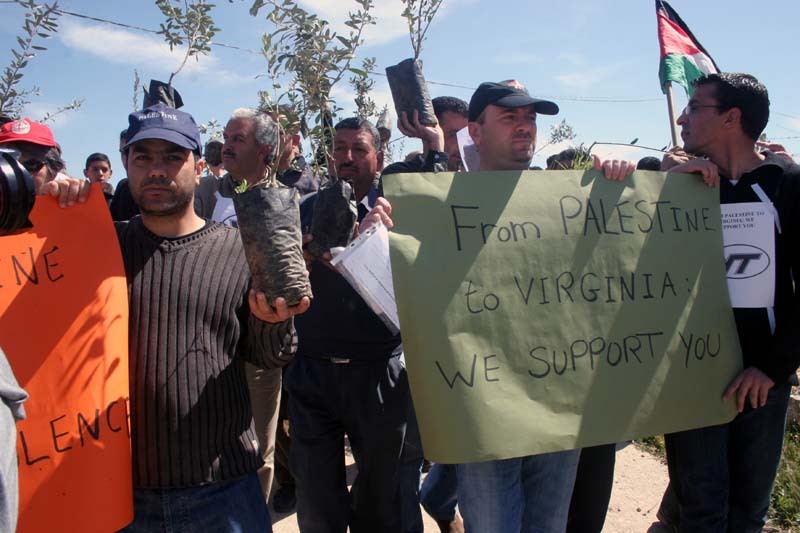 As has become a tradition, every Friday we join what sometimes are tens and other times are hundreds of Palestinians, internationals and Israeli nonviolent activists demonstrating against the Apartheid wall that is being build around Palestinian villages in the Southern part of Bethlehem. Once completed, the wall will eat up more than 70% of the agricultural land in this area alone and ultimately destroy villages that have existed for hundreds of years. This week also included a special occasion; it is the week Palestinians remember those who are imprisoned in Israeli jails. 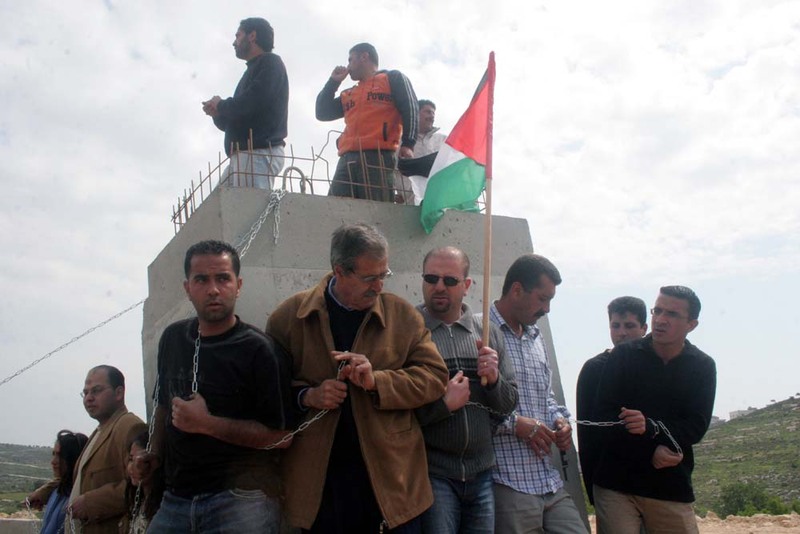 Our call this Friday was not only to release Palestinian political prisoners from Israeli jails but to also stop the building of the big open-aired prisons that the rest of us are being locked in. The organizing of the direct action for this week’s event was not different than previous events. 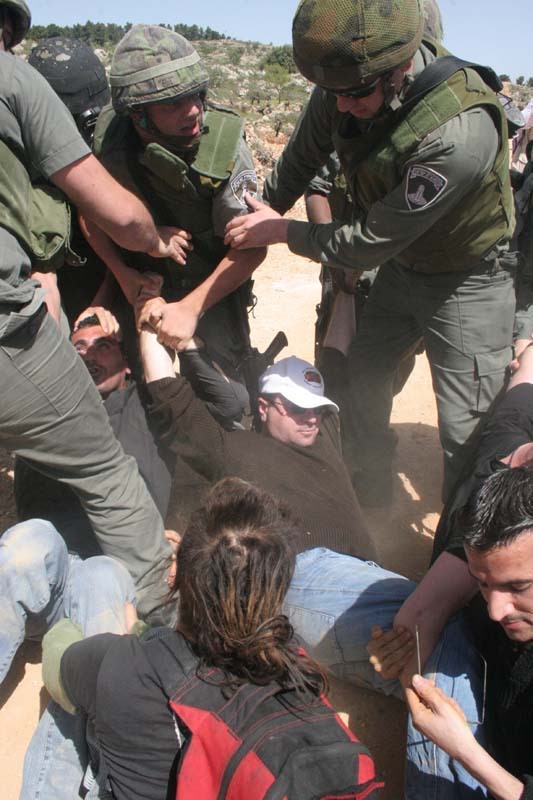 The commitment was not to engage in any form of violence against the Israeli army or any act that might be interpreted as violence and give the Israeli soldiers the usual “justification” as to why they attack demonstrators –if they wanted to suppress us then let them do it because we engaged in nonviolence. 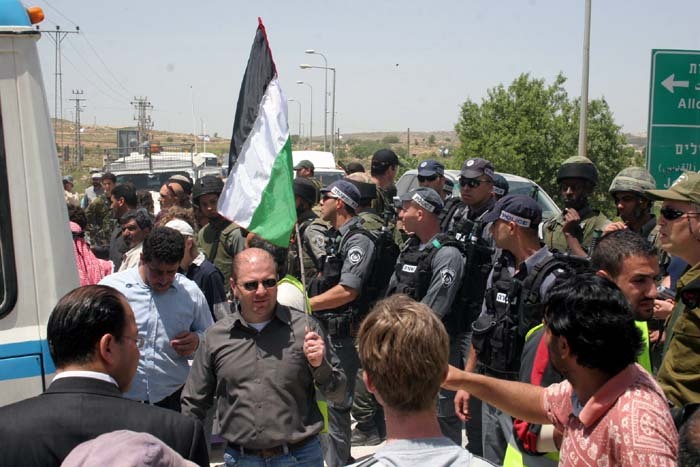 The nonviolent demonstration began with a march that started in the village of Wadi Nees and ended on the private properties of farmers whose lands are being confiscated for the building of the Wall in the village of Jorat El-Sham’a. 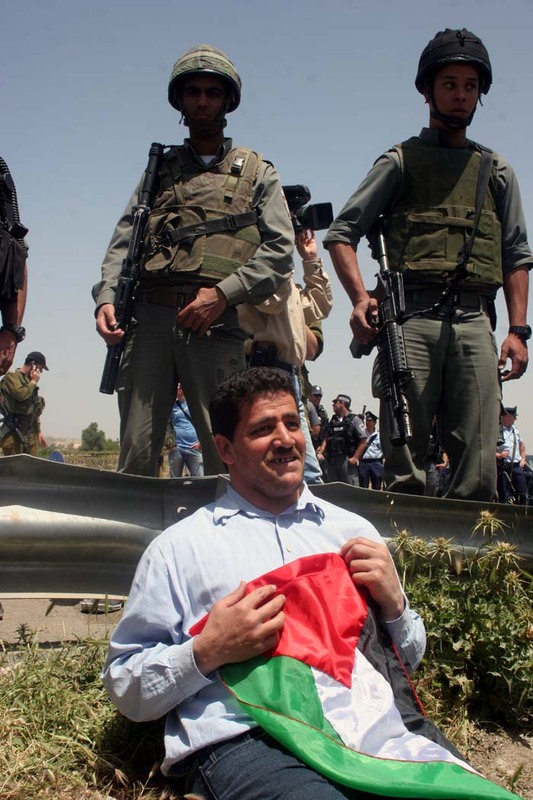 In remembering the thousands of Palestinian political prisoners we chained our hands, raised the Palestinian flags and called for their (and our) release. 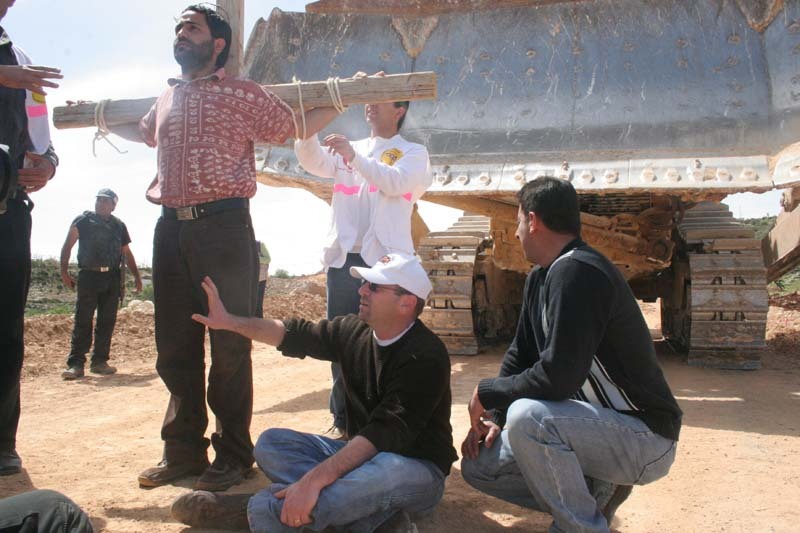 Once we reached the location some of the participants chained themselves to cement slabs being used for the construction of the wall, others symbolically destroyed a section of the wall, and others burned the wood used to build this ugly structure. 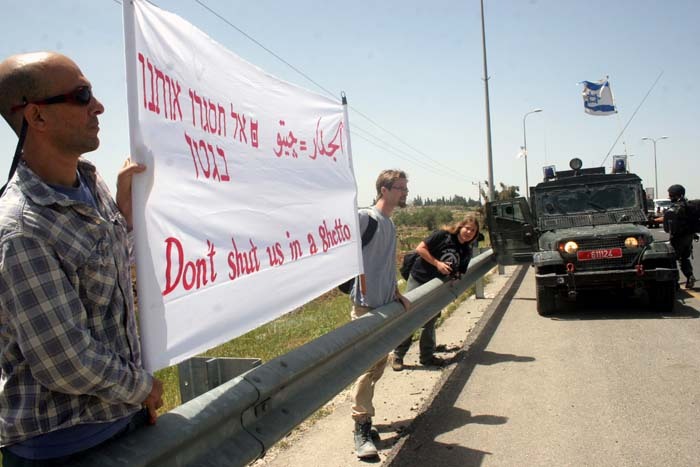 As the Israeli army approached we gathered in the middle of the road, sat on the ground and declared to the soldiers our commitment to nonviolence. 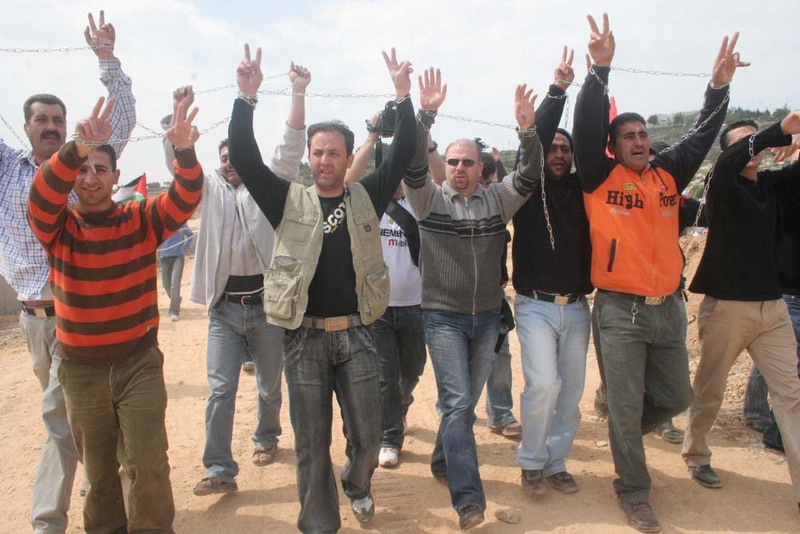 The soldiers were not ordered to remove us from the site or to dismantle the protest, as is usually the case, the orders were to “teach you a lesson” as one soldier remarked to one of the protestors. The only lesson that can be taught to a group of nonviolent protestors is to never engage in nonviolence again. Nonviolence exposes injustice, nonviolence exposes discrimination, nonviolence threatens established structures, and most of all nonviolence empowers others to move. It is Easter and Christians all around the world are celebrating the death and resurrection of the Prince of Peace, a man who suffered on the hands of those who occupied his land because he spread a message of peace, love and forgiveness to all human kind. 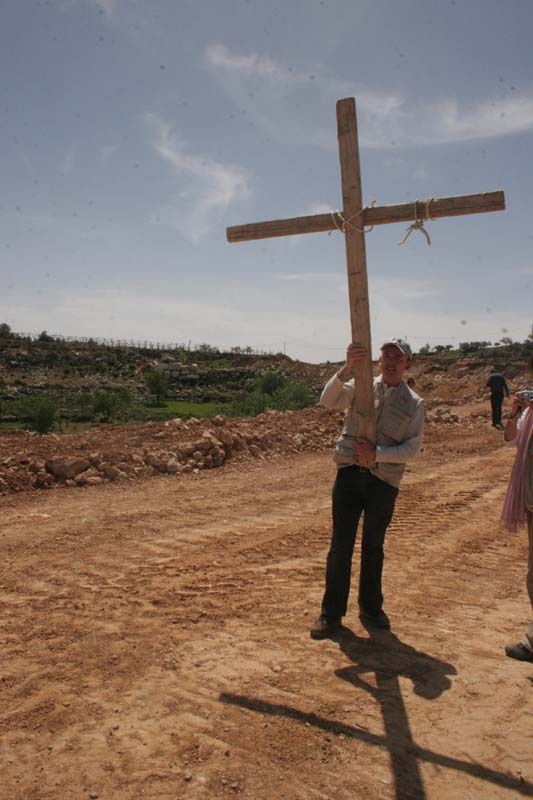 This year and like every year, we celebrated Easter in Bethlehem (where this great man was born), but more specifically; we celebrated this great event in the southern villages of Bethlehem, villages that are facing the brutal building of the Separation Wall that will eat up more than 70% of their farming land. I went there to celebreate Easter because I know if Jesus was here today this is where he would be and where he would ask us to be. He would not want us to be in fancy Churches or Cathedrals, in shopping malls buying the most expensive holiday clothes, or in big family picnics and feasts where more food is wasted than is eaten. He would ask us to go and serve, go and help, go and be with those who are in need. It was an honor for me to be with Palestinians, internationals and Israelis, Christians, Muslims and Jews all remembering this day in their own way, but sending one strong message to the world: As Christ was crucified 2000 years ago in Jerusalem, real peace between Palestinians and Israelis is being crucified today with the building of the Separation / Apartheid Wall and the confiscation of Palestinian land. The new thorns on our head are truly the wall being build around our communities and the new nails in our arms and feet are the military checkpoints and crossings that harm and humiliate us on a daily bases. 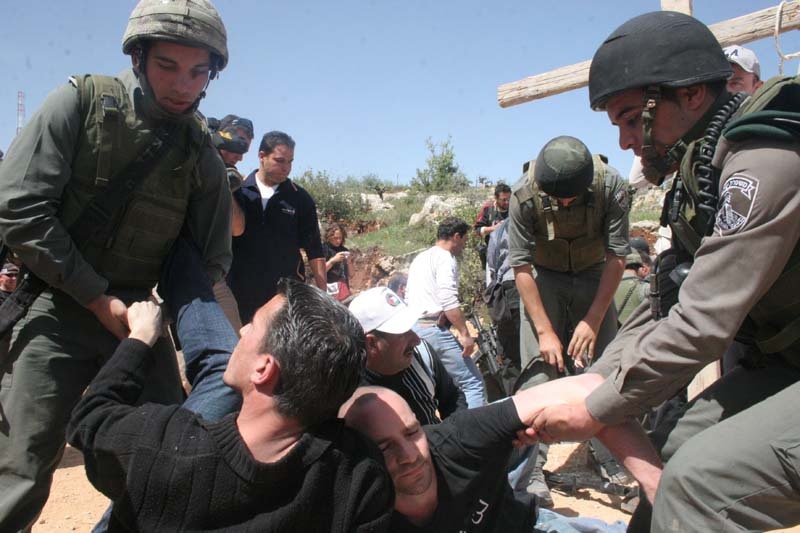 The response of the Israeli soldiers to our nonviolent demonstration was as would have been expected, harsh and brutal violence; several were arrested and many were injured. It was only through our determination that those arrested were released. That force is truly the force of the weak and it is my hope that those Israeli soldiers who beat us with their guns and kicked us with their heavy boots will truly understand this one day. But as there was a Resurrection after death, there is truly a chance for a real and just peace in the Holy Land. As people who believe in the hope for a better future, we commit ourselves to fighting for this goal no matter what the odds.